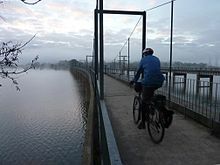 An Australian cycling/camping trip using public transport and combining the Great Victorian Rail Trail (previously called the Goulburn River High Country Rail Trail) with a return via the Acheron Way and the Warburton Rail Trail, 375 km approximately, 7 days. It starts and finishes at Melbourne railway stations. Yea Caravan Park had adequate space for campers on the grassed area, even in peak season. Visit the Yea Wetlands. The Yea Flora Fossil Site is home to the fossils of ancient vascular land plants shown to be the oldest of their kind in the world. This finding by pioneering Australian scientist Isabel Cookson overturned long held scientific understandings of how and when plants evolved. Visitors can learn about the fossils and their importance to Australia's geological history at the Yea Wetlands Interpretive Walk. The 200m Cheviot railway tunnel was built in 1889. The Giddy Goat in Yarck is recommended for morning coffee. Bonnie Doon books out early in the holiday season. Its also a busy boating and water skiing centre. We camped on the side of the trail 3km past Bonnie Doon. Maindample has toilets in a park, camping there is probably OK but we didn't ask. Visit the Mansfield Mullum Wetlands at the end of the the trail. The film The Man from Snowy River, was made around Mansfield, it was based on a poem by Banjo Paterson with the same name. We got a start on the next day by returning to Merton and camping at the Merton Racetrack. The toilets are clean and not locked but there is no shower. The locals are OK with the camping and very welcoming. The Merton Amateur Turf Club holds one race a year on New Years Day, it was founded in 1865. 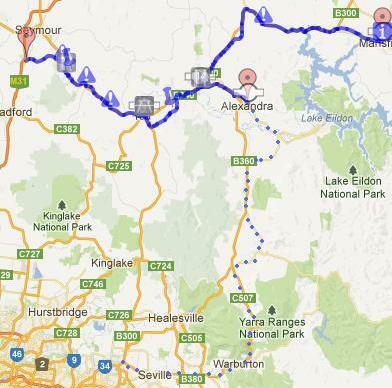 Alexandra has 2 caravan parks, the Alexandra Tourist Park or the sleepy Showgrounds campground. Book for the Showgrounds at the Tourist Information Centre or ask the manager at the first caravan on the right. Visit the Alexandra Timber Tramway Museum open every second Sunday, you are welcome to look around when its closed. This day diverts from the Maroondah Highway twice to avoid traffic, adding an extra 24 km. Thornton has a caravan park and motel, an alternate stopover. 90% of Marysville was destroyed in the Black Saturday 2009 bushfires. Alternatively you can continue to the Acheron Way which has many opportunities for free camping just off the road. At Acheron Gap, you cross the Great Dividing Range, the third longest land-based range in the world. The range stretches more than 3,500 kilometres from the northeastern tip of Queensland, running the entire length of the eastern coastline through New South Wales, then into Victoria. The forest contains approximately 40 different mammal species, including the endangered Leadbeater's Possum and 120 species of birds. The bird species include the Sooty Owl, Powerful Owl, Barking Owl, Pink Robin, Yellow-tailed Black Cockatoo, Australian King-Parrot, Grey Goshawk and Crimson Rosella. The Upper Yarra Museum is at Yarra Junction, partway along the trail. Lilydale station connects to the Metlink suburban rail network. The larger towns are Yea, Mansfield and Alexandra with a range of shops including supermarkets. There is a bike shop in Yea and a sports store in Alexandra. The western sections of the Goulburn trail are topped with granitic sand, the eastern sections with black gravel. The western sections could become a little sticky in wet weather. The Taggerty-Buxton section of the Maroondah Highway has a bitumen shoulder, effectively a bike lane. The Buxton - Narbethong section of Maroondah Highway has a gravel shoulder, should you chose to ride it. The Alexandra - Taggerty shoulder is unknown, should you chose to ride it. The Goulburn trail has toilets every 2 hours or thereabouts, the water tanks are labeled 'reclaimed water, do not drink', but its just rainwater. Vline say on their website that, 'V/Line conductors will determine whether there is enough space for you to take bikes on these trains' but I have been told elsewhere that you are OK with 4 bikes on a train. The Metlink suburban network carries bikes free but you are requested to use the rear of the last carriage.